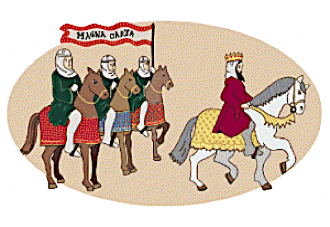 The Magna Carta Day celebration is an annual event held in Egham High Street to commemorate the signing of the Magna Carta on Runnymede, on 15th June 1215 by King John and his Barons. Magna Carta Day is opened by the current Mayor of the Borough of Runnymede and a parade along the high street commences shortly after the opening ceremony. There are stalls, funfair rides, food and drink and all forms of entertainment, including live music, children's entertainment etc. There are and lots of choices of food and drink. The celebration fully involves many of the local businesses in the town and restaurants, cafe's and bars sell their wares in the high street. People come from all over and fully immerse themselves in the festivities. The culmination of the day is a firework display which is usually held on the Sports field of Strodes College. It is a worthwhile day to visit Egham and enjoy and participate in this annual event.